Back in High School I took up Scroll Art. I spent almost the entire 2nd half of my senior year making this. I had to ditch a million classes to sneak into woodshop, and even stayed late after school to finally get it done. I wasnt able to finish it before the Art Contest which my Woodshop teacher said I would have won with ease, but when people ask me, “If you had to leave your burning house and could only take 1 thing, what would it be?” My answer is this…. 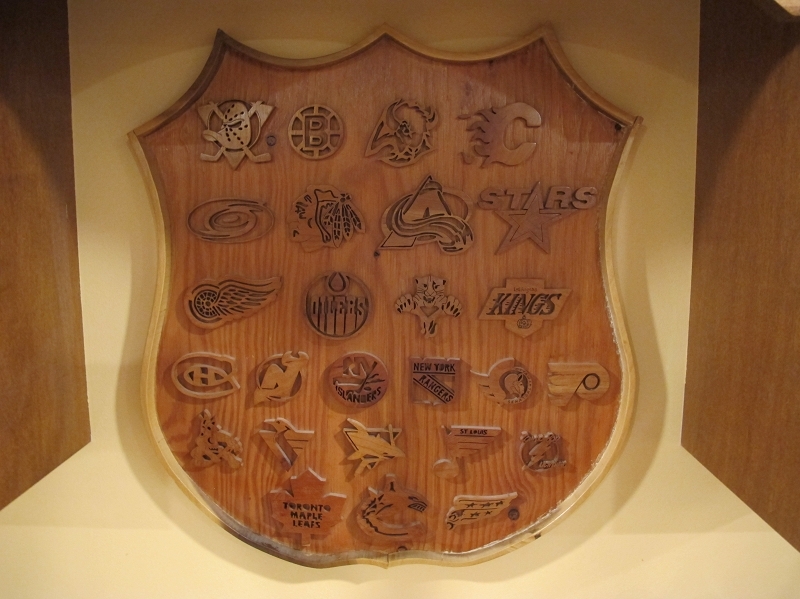 At the time I created this, these were all the teams in the NHL. 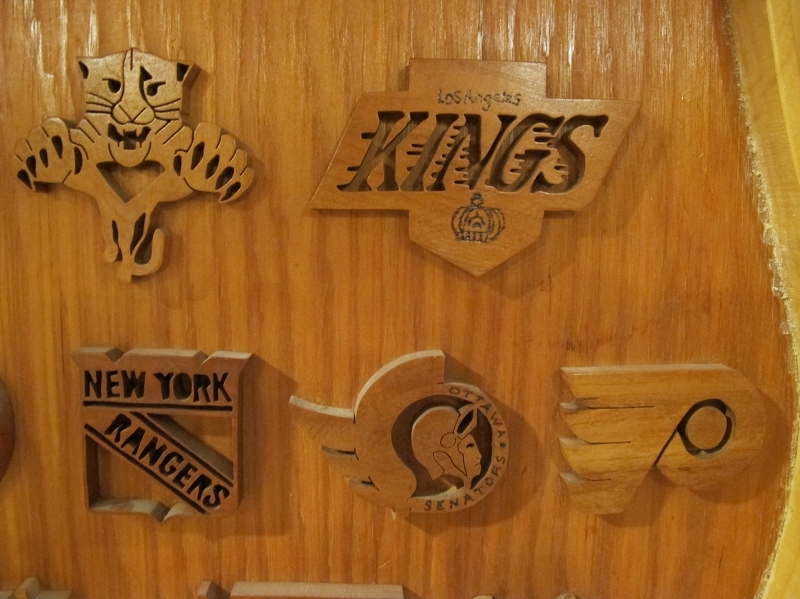 I had to individually cut out every single team, and many of the teams had multiple pieces. I have enclosed some close up pictures so you can see how thin some pieces of the wood got. Some of the teams were so hard that I had to do them 2 or 3 times. The Ducks one was pretty easy, but required a lot of drilling. The Bruins were easy. The Hurricanes piece was complete hell. That wood is only a couple millimeters thick. And the middle of that hurricane is attached to the outer circle. The Blackhawks sucked too. Making the feathers was really hard. I did him on my first try, but it took me forever. I love the way the Sabres turned out. His eye was the hardest part because its attached by such a small piece of wood. The Flames were cake. The Avalanche was complete headache. If you follow the wood you can see how thin and long some pieces were. The Stars was simple. 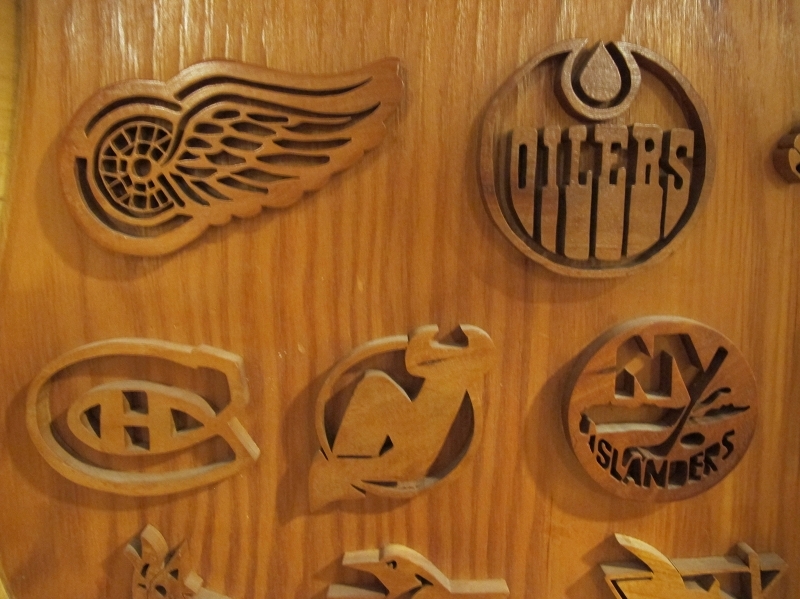 The Redwings took a long time, but I really enjoyed making it. I knew it was going to look nice. 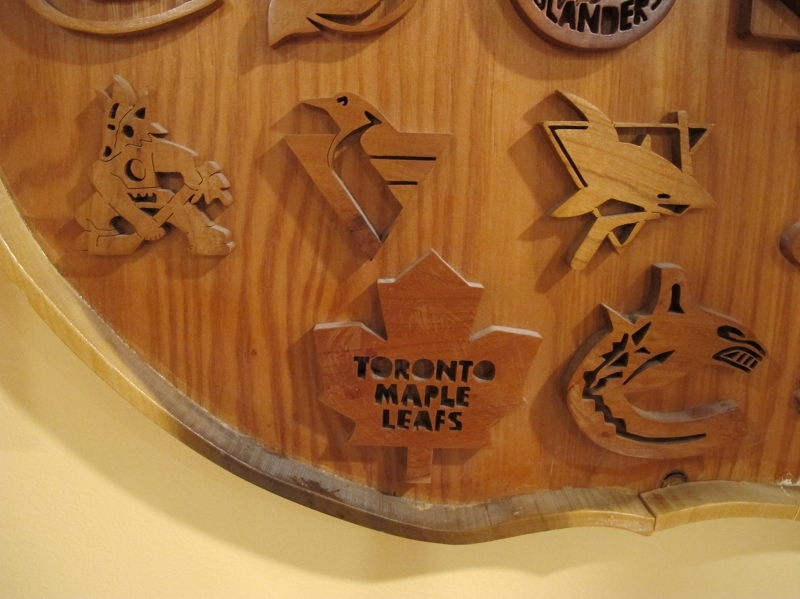 The rest were easy except for the Islanders, the letters were a pain. The Panthers almost made me go postal. The whiskers make the wood very brittle, I had to do that one a couple times. The Kings was easy to make. I had to burn the letters and crown in, too small to saw. The Rangers were easy. The Senators required burning as well, and the head was hard to cut out. The Flyers were easy. Coyotes took a while to decide how to cut it, because it didnt have many pieces you could cut, so I made lines. 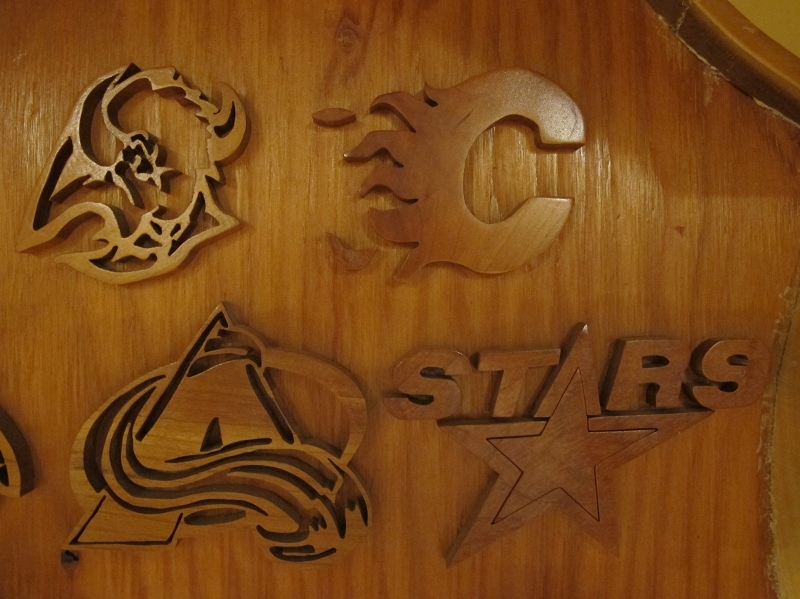 The sharks took some time, and the Canucks symbol had a difficult mouth, but the rest were easy. 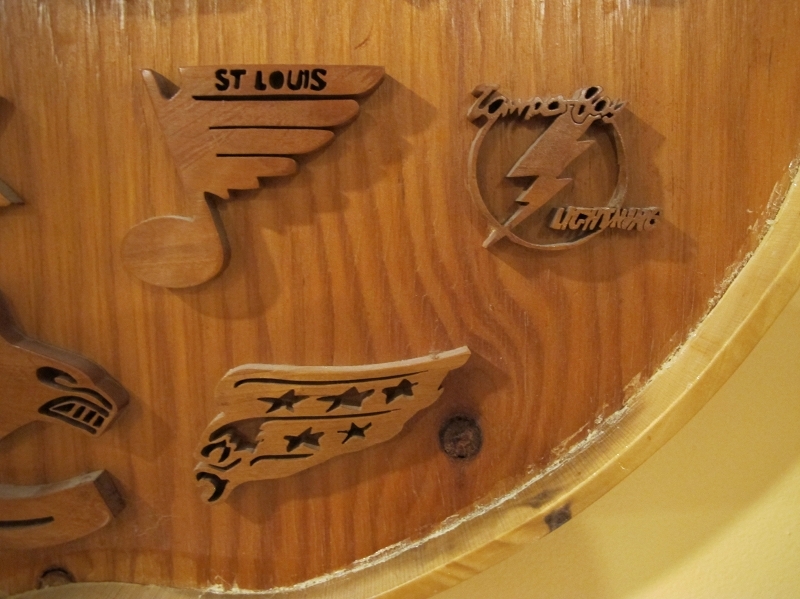 The Blues and Capitals were pretty easy to do. The Lightning piece was by far and away the hardest, and the piece I am most proud of. Everyone told me that it would be impossible to cut, and I did it on my 2nd try. 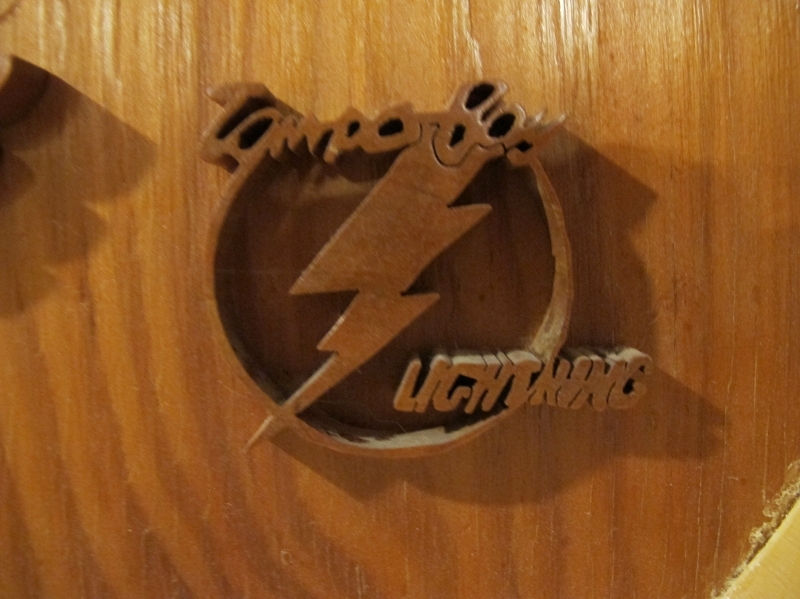 That word “Lightning” is 1 piece of wood, and its attacked to the millimeter thick side. If you picked that piece up, it would be whole. Thanks, I made this 20 years ago. 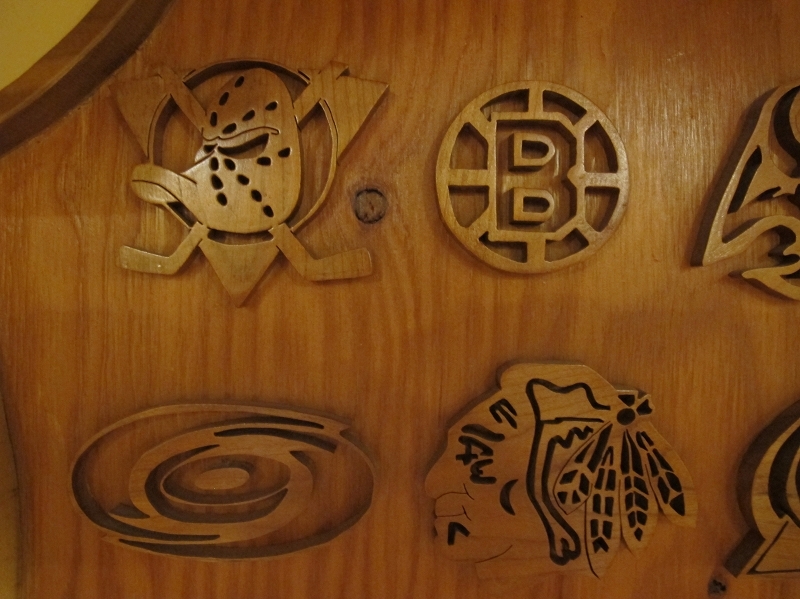 I just took the images and used a scroll saw to cut them out.